Finished in 22:34(Official Chip Time); 7:17 pace; No PR but top 5%. It was a perfect day for a race in the mid 50's and near 60 when we finished. According to the race, over 10,000 people were running. Overall good organization, great theme, of course, and good time. Registration was quite easy. You could print out your application and mail it in or you could sign up online through Hughesware on the race website. I've talked about this company in the past and the online process is very simple through this company. 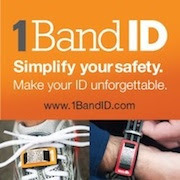 It seems many in the area are going to this company for race registration. Two minutes and I was registered. The design of the Corktown 5k website was very good and unique. In addition, the race sent an e-mail with all details for the race and covered everything you could think of. In regards to packet pickup, the organization was excellent. 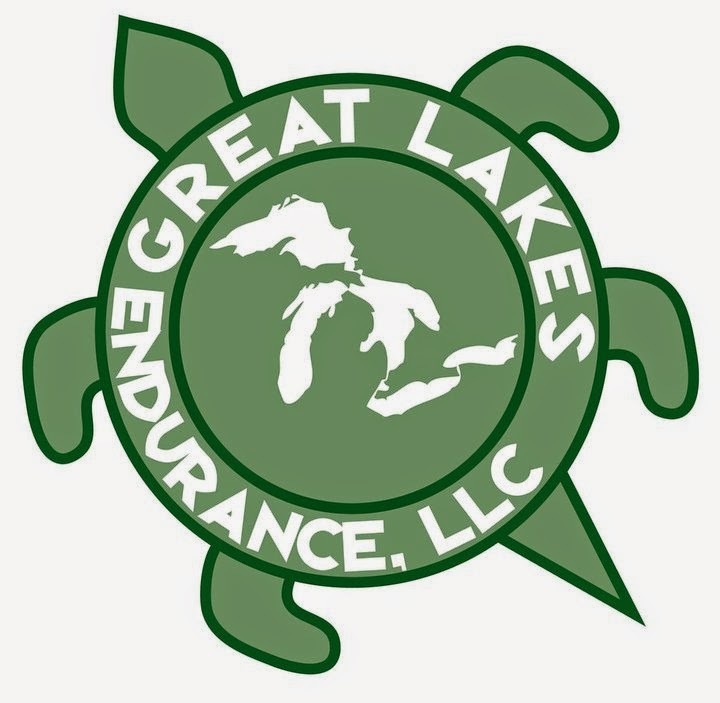 The race staff had several(5) locations throughout the metro Detroit area to pick up your race packet before race day. It was encouraged to do that given the crowd and I would suggest anyone running this to pick up early. You had six days to get your packet which is incredible flexibility on the part of the race and it's volunteers. I chose to go to the New Balance store in Troy to get my packet. The volunteers were set up, they pulled your name up on their computer and scanned a bib for you, and assigned the bib to you. Because of the system they use, you can go to any location offered to get your bib. This is extremely convenient and I love the way this system work. I also picked up my race shirt as well. I was in and out of the store in about 5 minutes. You also had the option to pick up your packet on race day as packet pick up opened at 10am, a full two hours before the race start along with registering for the race that morning. My running buddy, Kevin, and I left his home about 10am with the race set to start at 12 noon. It take a little getting used to running mid day after you ate but I don't mind not having to get up so early. The reason for the noon time is that the race is run just before the St. Patrick's Day parade that was expecting about 65,000 people after the race. ﻿ Parking was crazy! Not only runners but parade traffic was busy. We got down there about 10:45am and it was already crowded but we were able to get a free parking spot about four blocks away from the race. It really worked out quite well and we had plenty of time to get to the race, use the bathrooms, and take some pictures before we had to get in line for the race. 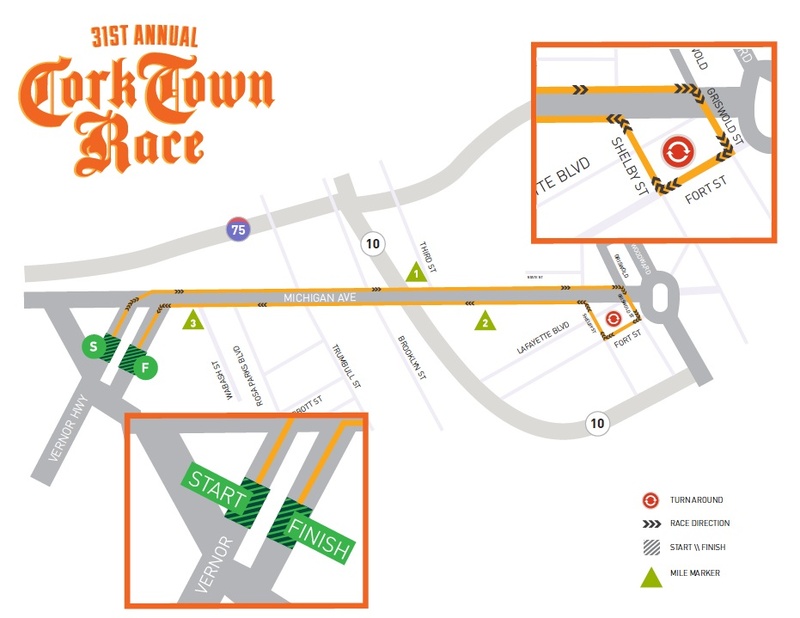 The start area is located in Roosevelt park in Corktown. Corktown is the oldest neighborhood in the City of Detroit. It's very rich in history and has tons of pubs/bars and a great place for the race and parade. 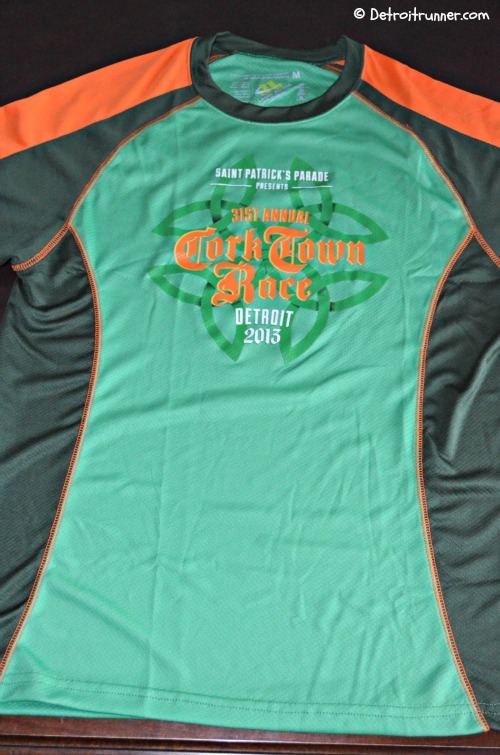 The Corktown 5k was actually my very first race 3 years ago when I started running so it has a special place in my heart. As we walked from the car to the race start, we saw this incredible building that had "Welcome to Corktown" on the side of it. Cool! ﻿ As we made our way into the park a bit more, we saw the Roosevelt Park sign so I grabbed a quick picture of it as well. There were already tons of runners there. ﻿ The park is actually perfectly laid out for a race. There is plenty of green space, there is a road going out and coming in for the start and finish and plenty of room for everything. The start is located next to the Central Train Station that has been sitting vacant since I can remember. I wish someone would buy it and renovate it and make it nice again. There were plenty of bathrooms at the start line and the lines moved quickly. I told my running buddy that I'm probably the only one at the race that would take pictures of port-o-potties. Haha! There were also port-o-potties on the course as well. ﻿ The race had a huge tent set up for information, a help desk, and race day registration. 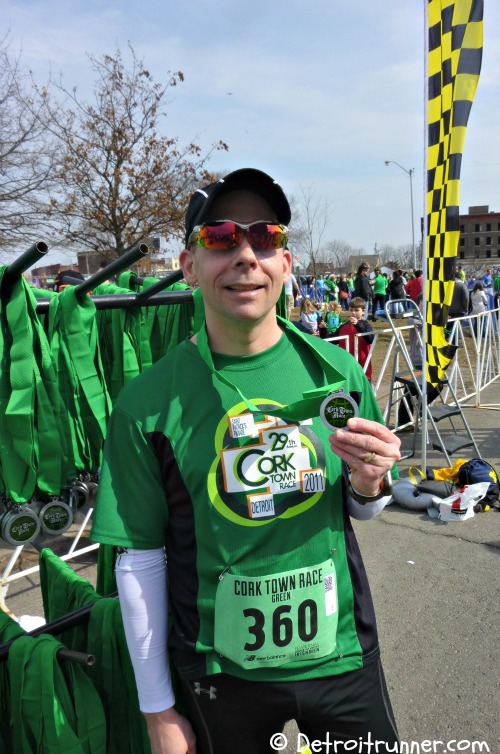 Since over 7,000 people picked up their packet early, there were over 3,000 people who picked up their packet that day and/or registered that day since the race announced that over 10,000 people were running. On the other side of the tent was a huge area where you were able to pick up your packet that day. While I would recommend picking up early, it didn't seem to be an issue picking up that day if you really wanted to. The race was also having a contest for the best costume. There were tons of people dressed up for the race. While I'm not really into that, I think it's great for people who are interested. They had a tent set up for the judges to look at you before the race. I also got a couple pictures before the race of the start line area. As you can see, there is a sign to the left that shows "Green Wave" to help you know where to get in line. They had three waves - Green(under 8 pace), Gold(8-10 pace) and White(over 10 pace). Green being the fastest. Based on this, you could not get into the start area unless you had the right bib. I was very, very pleased to see the race staff/volunteers were enforcing this and keeping people in the right corral. I even heard a staffer ask a volunteer to make sure nobody but green bibs gets in. Everyone I saw in the Green wave had a great bib. Of course, they could not prevent people from signing up for a wave they should not be in but overall, I think it worked out quite well. ﻿ You can sort of see below the gold wave flags way back there. This year, they kept some space between the two waves and this helps tremendously with congestion. You will see it in a couple pictures later. Before we got in line, we saw all the kids lining up for their 1 mile race. They also received medals which is awesome! 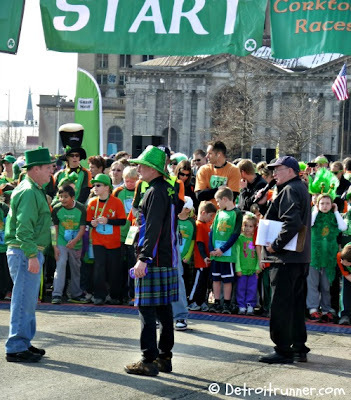 Here you can see the kids all ready to race below and the race director, Doug Kurtis in the middle in the kilt and green hat. For those of you that don't know, Doug is an elite runner himself winning the Detroit Marathon numerous times. Since we also had enough time, Kevin and I got a quick picture before the race. He was registered in the Gold wave and I was registered in the Green wave. Here's a couple pictures of in front of us and behind us waiting to start. Frankly, I thought there was going to be many more runners in the Green wave and, while it was crowded, we were fairly close to the front. Start - ready to race! They blew the horn to start the race and we were off. The course is basically an out and back course. ﻿ I started out quite fast, considering I was not planning on racing this race, completing the first mile under 7 minute pace. I had not planned to go out that fast but was feeling good. The plan was to take lots of pictures since I love running in the City of Detroit. 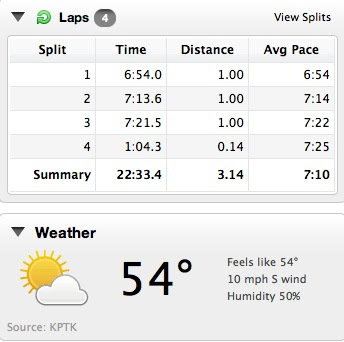 Here's my splits for the race before I show you all the pictures of the course and check out that temperature for Detroit in March! As you can see, I slowed it down quite a bit for the next two miles but still kept a pretty good pace. While I was not racing this, I still pushed myself pretty hard and finished pretty well for me. In fact, this time is only 15 second higher than my PR so I guess you could say I was pushing really hard. I felt I could go faster had I not been taking so many pictures but this one was all about fun and I was still very happy with my time. I love the change in the course in regards to the turn around. It is a much better way to do this. 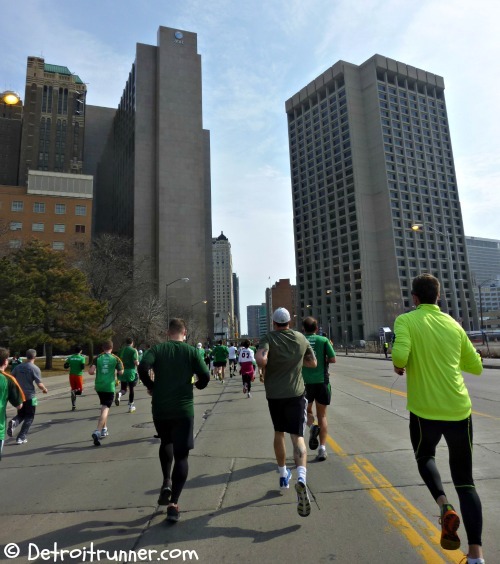 Last time I ran it, we did a turn around on Michigan Avenue and all it did was slow people down and back people up. This was a huge improvement in the course. You will note that some of the following pictures are not perfect but keep in mind that when I run these races, I do NOT slow down. However the pictures come you, they come out. My goal is to get some decent pictures but I also do not want to cause any issues on the course when taking pictures so I keep my pace. Taking it down Michigan Avenue! ﻿ When I took this picture below, I could not believe how many runners were still coming. This is probably about the 2 mile mark. There was such a steady flow of runners, it was cool seeing this. There were also a ton of volunteers making sure people stayed to the left so they would not come towards us runners coming back to the finish. ﻿ If you've never run a Detroit race, you should. Seeing the cobblestone streets and running on them is an incredible feeling and one that every runner should experience. Because the course is an out and back race, it makes for an easier time providing water since you can have one aid station using both sides so you get two for one. While there only a few volunteers on this side as I ran past but I was fairly close to the front and so more volunteers were needed on the other side from what I could see. There seemed to be an extra amount of volunteers out on the course not only for the aid station but throughout the course directing people. I'd say there were more volunteers than I've ever seen on a 5k course but then again there were 10,000 people running so it worked well. Again, the finish line was very organized. It was wide for all the people that were coming, it was barricaded off well as you can see below and there was plenty of room. I want to specifically note that the finish line and the place to get your medal was some distance between the two. This was the best thing the race staff could have done. It allowed for no backups for people waiting for their medal. The space was enough that runners could walk after the finish and keep walking until they got to the medals. I commend the race for their organization on this aspect. 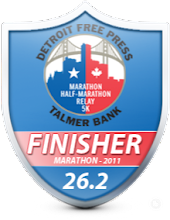 ﻿ You can actually get a good idea of the distance between the finish and the medals given how close the medals are to where the Michigan Central Station building is located. Again, good move on the part of the race organizers. They had plenty of volunteers on both sides giving away the medals and they were only going to the runners which is what it should be. ﻿ I was able to wait for Kevin and Lisa and we were able to get a post race picture with our medals as well. ﻿ After the medals, you could get your water and food. They offered small water bottles which was nice and enough that you didn't throw out part of the water. In addition, they offered bananas, apples, pretzels and cookies. I was happy to see the signs stating "just one" and "runners only". I have been at races where runners take tons of food and the race runs out which I think is terrible. The race was trying to enforce this and I encourage it. For the $30 registration fee(plus $2.95 online fee), you received a short sleeve tech race shirt, a timed race bib with a QR code for immediate results(a great new feature), a finishers medal, finish line water and food and I believe there was also free beer(although I can't say if it was officially part of the race) The design of the shirt is one of the better ones I've seen including a three color shirt. The medal design is great as well! The organization of this race was excellent. It started with the website - an incredible design. They have a Facebook group that answered all the runners questions throughout the process for every detail. The registration process and packet pick up was simple. The start and finish layout was superb! The course layout was excellent and certified. The volunteers were everywhere! The food layout was right where it should be. I have to give kudos to the race management, staff and volunteers for this race. Given the amount of runners at this race, I have to admit I was a bit concerned how it would go. They really did an excellent job in every area of the race and I'd be happy to come back another year. Of course, it didn't hurt that the temperatures were amazing as well but I would have been just as happy with temperatures in the 20's. The fact that they have to deal with another 65,000 people from the parade adds another level onto what they have to deal with and everything that I could see went incredible well. ﻿ Have a great day and....Keep Running!!!! Another great review. You do Detroit proud. See you in two weeks for the CF half marathon. Yeah, I looked for you but didn't see you. I can imagine garbage patrol was a tough job that day with so many people. Thanks again for volunteering! I think you volunteer at least as many races as I run. 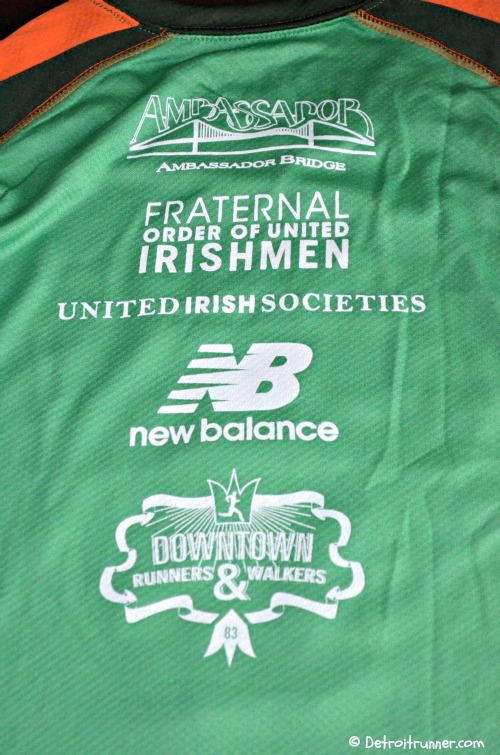 I'll be volunteering for the ShamRocknRoll Run expo on Saturday. Awesome Review!! I agree with Mark above that you do Detroit proud!! Awesome post! I agree that this is a great race. 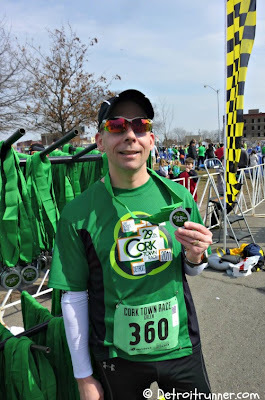 This was my second time running Corktown and this year I got a PR! I'm no where near as speedy as you, though (I was in the white wave). I love running through Detroit! One of my favorite races (which is no longer in existence) was Heart of Detroit that ended behind home plate at Comerica Field. Detroit truly is a beautiful city. Yes, Lori, Detroit is a great place to run. Great Recap and was good to see you again! For having such a hard time meeting up that was the third time this week I saw you! Great pics, too, during the race! How do you manage to photograph while running so quickly! ?